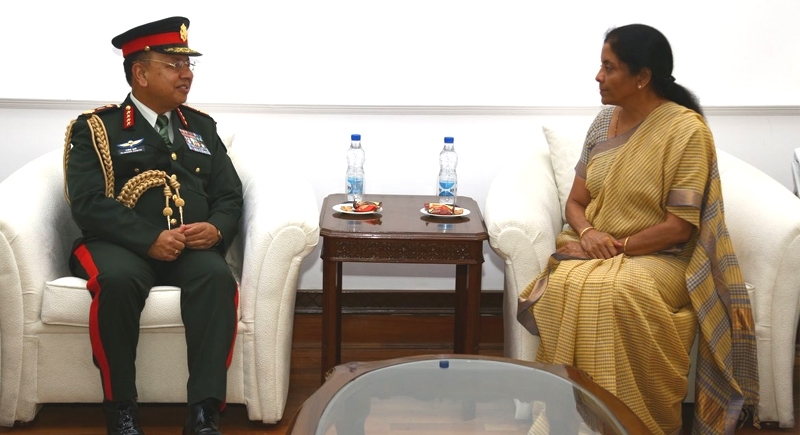 New Delhi, June 8: Embarking a visit to India, Nepal Army Chief Rajendra Chhetri sought a fruitful bilateral talk with Defense Minister Nirmala Sitharaman. The two countries have had a strong historical base and have also stood by each other in terms of support and assistance regarding any matter. The Nepal Army Chief Chettri and Raksha Mantri discussed ways to deepen defense and security cooperation between the two countries. The discussion was based on issues related to bilateral defense cooperation figured prominently during the meeting. The Indo-Nepal border is open, porous and thickly populated. The movement of people across the border is governed by Indo-Nepal Treaty of Peace and Friendship, 1950, which provides for free movement of citizens of both the countries across the border. The Nepal Army Chief's visit comes nearly a month after Prime Minister Narendra Modi's visit to that country during which both countries had decided to bolster defense and security cooperation. Aiming to consolidate the bilateral ties, this meeting between the Army officials will tend to make the relations even stronger. General Chhetri is visiting India at the invitation of Indian Army chief General Bipin Rawat. A joint military exercise 'Surya Kiran', involving around 300 army personnel of India and Nepal, is underway at Pithoragarh in Uttarakhand, where they are sharing their experiences in counterinsurgency and counterterror operations.